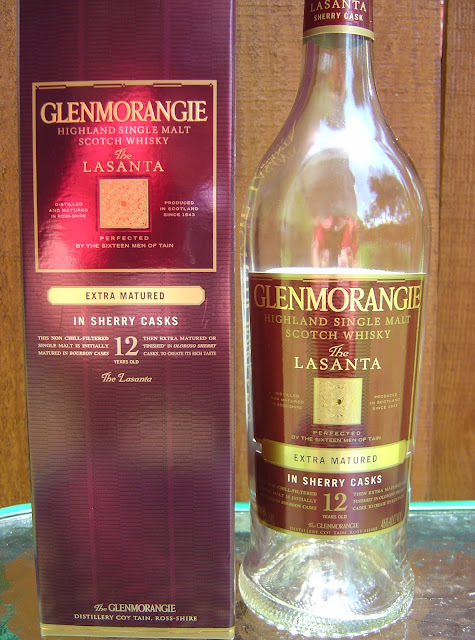 Glenmorangie The Lasanta is the first Extra Matured expression of The Original Single Malt Scotch that I decided to taste. I'm sure you remember that I bought a sampler pack that includes 100 mL bottles of each of the four (including The Original). Though I'm pouring from the little bottle, much of the information I am taking, including some of the photos, comes from the packaging of a previously finished 750 mL bottle. Yeah, that was a sad day! The Lasanta started out as The Original, which was aged for 10 years in American White Oak Bourbon casks. For the record, Glenmorangie only uses these casks twice to ensure a benefit from the newness of the wood. After 10 years, The Original is Extra Matured for two years in a number of ways. For this expression I'm trying today, The Lasanta, those extra two years are spent in Spanish Oloroso sherry casks. Imported by Moët Hennessy in New York, NY. Well, as advertised, the nose is pretty spicy with some strong Sherry up front. But the more you sniff it, the more you will be able to dissect some of the nuances that make for an awesome bouquet. Plenty of soft, soothing honey, a buttery aroma and some hints of oak. After a while, I started to detect some almond scents. Very rewarded is the patient smeller! Honey flavors, honeysuckle flowers... no wait, both. Mmm. Hazelnuts and toffee meet a very spicy sherry flavor profile, even felt on the lips. The honey does work some magic to sooth that away, without taking away the flavor charm. Raisins, candied orange. Really quite delicious. Very smooth with some 46% alcohol heat kick at the end, felt especially in the chest. Try it. You'll like it. Might even be the spirit that will make you switch!